Rice is the second most consumed cereal in the world, after wheat. More than half of the world’s population eat rice. About 90% of rice is produced in the East and there are many types, divided and grouped based on the type of the grain. The Arabs brought it from the East to the West, to Sicily, in XI century. However, it was the massive starvations, wars and plagues of XII century that marked definitively the consumption of rice. The first proofs of paddy fields in Italy, created by Ludovico Il Moro together with his brother Galeazzo Sforza, are found in Lombardy and Piedmont and date back to late XV century. Throughout the centuries, Italian rice became a true culinary reference and its trade was developed and enhanced by Camillo Benso Conte di Cavour. Rustichella d’Abruzzo has chosen and proposed again the most refined types of Italian rice for you, such as Carnaroli, Arborio and Vialone Nano. Carnaroli rice was created in 1945 by mixing Vialone rice and Lencino rice, the latter having not a small, rather a lengthened grain like the former. 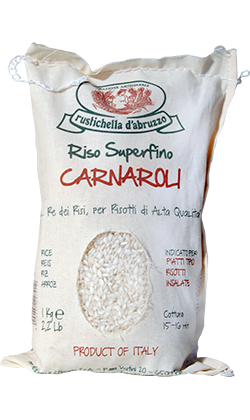 Concerning quality, Carnaroli can be considered the best type of rice and it somehow represents excellence among all of the Italian types. Starch from Carnaroli rice is the richest in amylose, a substance which helps keep the grain firm and always ‘al dente’. Its incomparable feature is mainly the excellent capability of absorbing aromas and condiments and releasing starch while being cooked, in order to blend and intensify the tastes of different foods. Therefore, it is suitable also for preparing rich and tasty salads and timballi. Cooking time: 15-16 minutes. 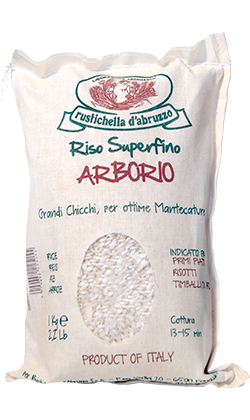 Arborio belongs to the category of superfine rice. It was created in 1946 by mixing Vialone rice and Lady Wright rice. The grains are well compact and lengthened, bigger than the Italian rice and the one produced all over the world. It is cultivated mainly in the Po valley, as it is suited to the weather conditions of that area, especially in case of clayey and alluvial soils. Its unique “look” derives from its big and pearly grains and high output. During the preparation, the grains cook perfectly and uniformly, keeping the central nucleus,which is rich in starch, al dente, and always providing an excellent creaminess. Cooking time: 13-15 minutes. 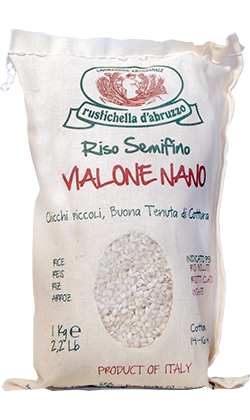 Vialone Nano is a type of rice with a Protected Geographical Indication, originally from the “bassa veronese” area, whose main feature is to be cultivated in irrigated areas with pure resurgence water, representing the pride and passion of the Po Valley. Among the types of rice made by hybridisation, this is the most ancient one, almost considered as the ancestor of Italian rice. Its grain is round and medium in length, about 5/6 mm, most suitable for preparing refined risotti thanks to its high resistance in cooking and extraordinary capability to absorb the condiments. Extremely versatile, it is recommended also for preparing vegetable soups, broths, rice croquettes or arancini (rice balls). Cooking time: 14-16 minutes.